Meditating on the notion of peace, for a more restful state of mind or meditating for a more peaceful world is an intrinsic part of spiritual and relaxation practices the world over as far back as the recorded history of Eastern spiritual practice goes, some 5 millenia ago. As peace is essentially an absence of conflict, rather than abundance of goodwill and celebration (which in any case may not be entirely ‘peaceful’: think, for example of football celebrations!) it follows that an attitude of peacefulness will be attained through gentle contemplation and through an emptying of the mind of any thoughts at all. Arguably, thoughts themselves are a form of ‘conflict’, albeit a non-aggressive one: one thought tends to act against another, as ideas are mapped out and problems are solved. A mind truly at rest – and therefore at peace with itself – is clear of all ‘thought’. This thus engenders a positive attitude in which the person meditating gradually comes up against less friction in the outside world the more they meditate. If more people meditated it is said to follow that there would be more peace in the world. This, however, is debatable, their having been conflicts in many parts of the world undertaken by those who practice meditation or other similar spiritual practices. The degree to which meditation fosters peace for and around the practitioner may depend on the quality of the meditation as well as in carrying the experience of meditation through one’s life into the outside world. As meditation entails a letting go of thought, it also implies a letting go of one’s ‘self’, thereby indicating a that you realise a togetherness with the world around you as if there are no distinctions between separate ‘self’s’ we must thereby co-exist as part of one greater being, and in this sense peace is essential as any other action is unnecessary and nonsensical as you would essentially be acting against yourself. This, arguably is the meaning of ‘Karma’ in Buddhism and of the ‘judgment of God’ (or gods) in theistic religions: Bad action will come back at you, either as Karma or as the wrath of God as bad actions has its own immediate punishment – you effectively commit the action against yourself. 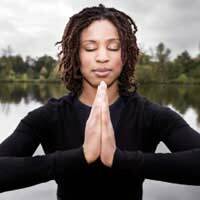 Meditation – or prayer - in any effective form (see related articles for several suggested exercises) is therefore an exemplary exercise that can both foster and point out the conditions of a peaceful existence for the individual and for society at large. By carrying the lessons learned through meditation into our everyday lives we can also affect those around us, thus bringing into action the practical existence of the principle that we are all connected and that our positive action can help to spread positive action and to bring to back to us (the opposite of ‘bad Karma’). Thus meditation can help in a real sense to foster the conditions of peace if people - acting upon their experience during meditation – wish to then make their actions an example of how best to live in relation to others.